FIFTH time lucky and my faith has been restored, a timely reminder that there is no finer mountain sensation than walking through the night into the sunrise. I had been due a break after four less than stellar outings on my Mountains of the Moon adventure, and the Pink Moon delivered in abundance. I had chosen one of Torridon's finest, Beinn Eighe, as a perfect fit for this moon, due to memories of a wonderful December sunset. A few years back I sat at the rim of the magnificent Coire Mhic Fhearchair as the sun slowly made its journey below the horizon, turning the soft red peaks of Flowerdale all shades of pink, the lochans filling in the landscape as shiny violet blotches. I was alone then but now I had company for the first time on this year-long journey, two mountain friends, Rebecca and Andy, stepping into the unknown. We spent most of the early part of the evening mesmerised as the full moon moved unhindered over the distant mountains, bathing them in a pink wash. It felt like an omen – this was going to be a good night. The moon stayed with us on the drive round, casting a long shimmer on every body of water we passed, a vibrant reflection on every slope. We set off before 11pm in full winter kit, adequate layers to combat the night chill, heavy boots, crampons and axes ready for any snow patches we may encounter higher up. 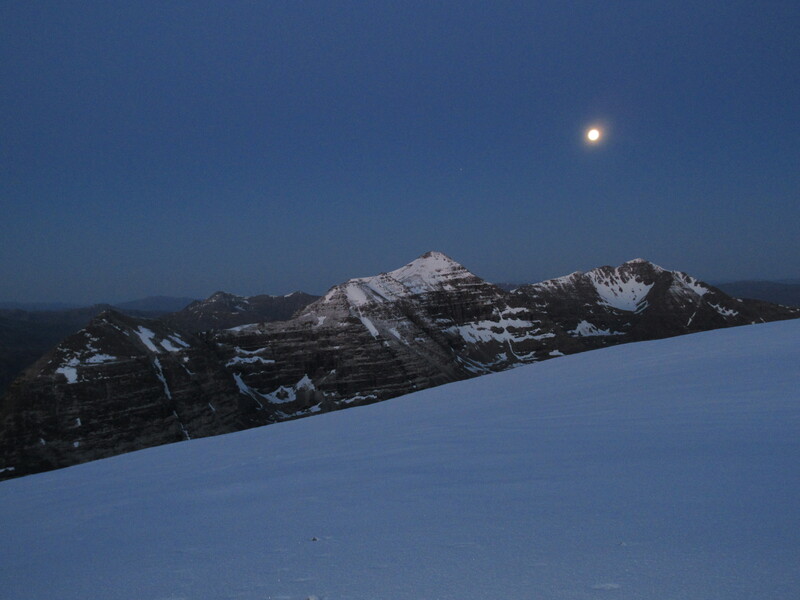 The moon was behind us, rendering head torches redundant on the initial walk in on the Coire Dubh path even with Liathach's dark walls looming on our left, casting a long shadow on to the slopes of its next-door neighbour. The torches were needed as we curved round towards Coire Mhic Fhearchair, the moonlight temporarily snuffed out in the depths of this valley of leviathans. At one point, we spotted lights in the darkness, then movement. Deer, gleaming yellow eyes and visible puffs of breath turning them into creatures more suiting a nightmarish fairy tale, holding their ground, as puzzled by the lights of these three cyclops lights as we were by their unusual appearance. We arrived in a corrie hidden entirely in shadow. The moon occasionally managed to shine through over the ridgeline but it seemed so diluted by the drop in height that the ground remained invisible. That lack of light saw us lose the path in the boulder maze, so we decided to take a direct line to the stone chute which leads to the main ridge. The topography was fooling us though. We could see a long, dark ridge on our left behind which rose snow-dusted slopes. We set this as our target and pushed on up, but it never seemed to get any nearer. Then the penny dropped – we had been trying to catch a moon shadow. Confusion over, we reached the shining white slash of the gully. Normally it's a scrambly inconvenience of an ascent but now it was filled with hard snow. Someone had been up not so long ago but the kicked steps they had made were filled with fresh snow, so we had to re-kick our way up the steepening angle with our axes as security guards. 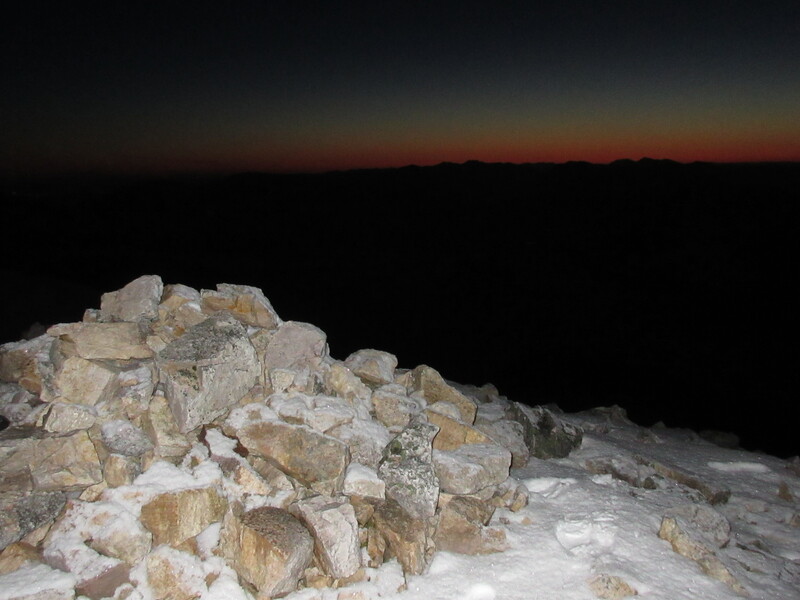 The gentler rise to the first summit of Ruadh-stac Mor was in fresh powder, lit from the western side by the moon and from the east by an orange, yellow and pink glow on the horizon, a tequila sunrise of a dawn approaching. 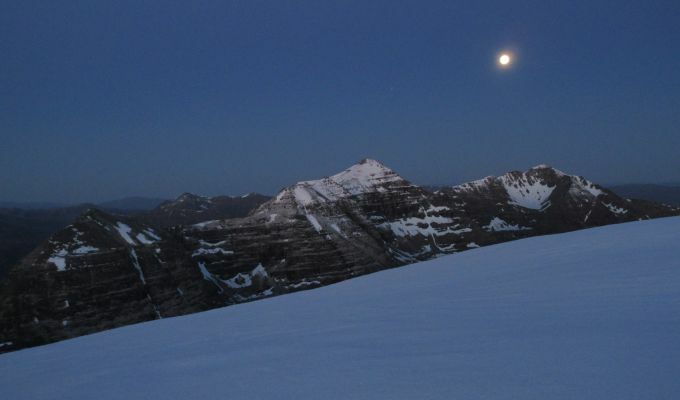 We pushed back along the ridge, the glow strengthening behind us, to encounter the formidable pyramids of Liathach looking like the high points of an alien planet with the moon sitting just above the summits. All around us the colours were changing with every step; copper, orange and pinks sluicing over the slopes of Coire Ruadh-staca, a blue horizon switching to pinks like litmus paper over Liathach, then its tips burning like hot coals. Within minutes we were walking in full daylight to the second Munro summit, Spidean Coire nan Clach, the dark rock towers in stark contrast to the blankets of deep, pristine white sweeping down its flanks. All thoughts of hurrying down for an early breakfast had long passed; now we just wanted to bathe in the glory of a magnificent sunrise. Walking from the darkness into the light has that effect on even the weariest of mountaineers. The silence, the beauty, the privilege of seeing the birth of a new day. It never grows old.